Tip: Unless you've disabled the bonus game, don't use a goal tape in a vertical level. The bonus game won't appear if a player happens to reach 100 bonus stars there. Not logged in. While this tool was intended for use on Windows, it's worth noting that it is Java based and works fine on other platforms. It works on Linux when simply running that jar directly as `java -jar "Graphics Editor.jar"`. Yes, you NEED JAVA. It won't launch without it. Overall, godd job! This was really helpful! I hate how you can't copy and paste between multiple instances of the program. The only issue I've had with this tool is after around 15 to 45 minutes of using it, the program glitches out and stops working for me so I have to restart it. Can get annoying after awhile but other then that, It's a nice tool. Dan: Oh ok, I had kind of understood that, but I had never succeeded! Now that you confirmed I retried and did it, no problem! Thanks! Really a neat program. And I confirm: JAVA IS NEEDED, or it won't launch. Does anyone know how to open this program? Change the first color at the start of each palette row, that black color is always used for transparency. -When pressing the "reload", "new" or "open" buttons after changing something in the image, the editor should bring up a confirmation dialog, informing you that unsaved changes will be lost and whether you really want to proceed. 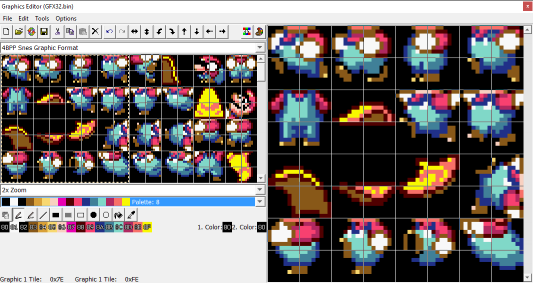 -It would be cool if the pixel selection tool supported copy & paste, just like the tile selection tool. I find it rather unpractical and unintuitive otherwise. What if you want to copy just a selection of pixels from one tile to another tile, for example? -Source code would definitely be nice! Those minor suggestions aside, definitely a nice tool. I think I even consider it more intuitive and easy to use than YY-CHR. Oh I can't wait to try this. Thank you so much for adding the F3 feature.